I have mixed feelings about this silk. * It is soft! Like rubbing your face on baby alpaca soft... I've never found a 100% silk this soft. Like most soft yarns it has a halo. *It has a lot more joins over traditional wools. This is simply the nature of silk, and I have noticed this to be true, with varying brands of 100% silk yarn. This is not a fault (joins are done nicely) but felt it is worth mentioning because some people get upset when they buy a $24.00 hank that has multiple joins. * Color, the picture is misleading. Like all natural silk, this is a creamy/yellow. Actual, bright white (bleached) silk is extremely rare and expensive...and, this isn't it. * This yarn is hard to dye as a solid. I will leave it soak for 24 hours before dyeing, I will wash it with synthrapol, and I dye with professional acid dyes. The result is more tonal then solid. And it is not a smooth tonal either. To get a solid, I have to hand paint (with the dye solution) the light areas and dye another time or two. This is not normal for silk yarn. The 100% mulberry silk yarn I import from India requires 30 minutes of soaking, no chemical washing, and dyes solid when I put it in the pot. I never have to redye or hand paint it. Silk is generally highly absorbent of dye, and I do not know why this yarn is not. That being said, I recommend using this yarn for kettle, speckle, or tonal projects...not solids. *Tangles. Any lace yarn can be a beast to untangle. After I dye laces, I wind them onto cones... because it is much easier then cakes...if you cake do not center pull this yarn. When dying, the nature of the this yarn and it's fuzzy halo can make it tangle very badly if you have to dye it a few times to get the color you want. Made a lace scarf with this. I love, love, love the feel of this yarn! It did split somewhat, I just had to be careful when knitting. This was my first lace project, so glad I used this yarn, very pleased with the results. I bought some of this to make a wedding shawl. It was wonderful to work with, blocked beautifully, and made a gorgeous shawl with the lovely sheen, perfect drape, & smooth softness that you'd expect from high-quality silk. I have since bought more bare to try dying, and 2 colors of the dyed varieties (both of which are STUNNING). FYI, in case anyone is looking at it for a wedding shawl, the bare color matches the David's Bridal "ivory" swatch/fabric pretty much perfectly (although with a bit more sheen). This is so very soft and it feels so good running threw your fingers while your working with it. The stitch definition is great and it drapes very well. 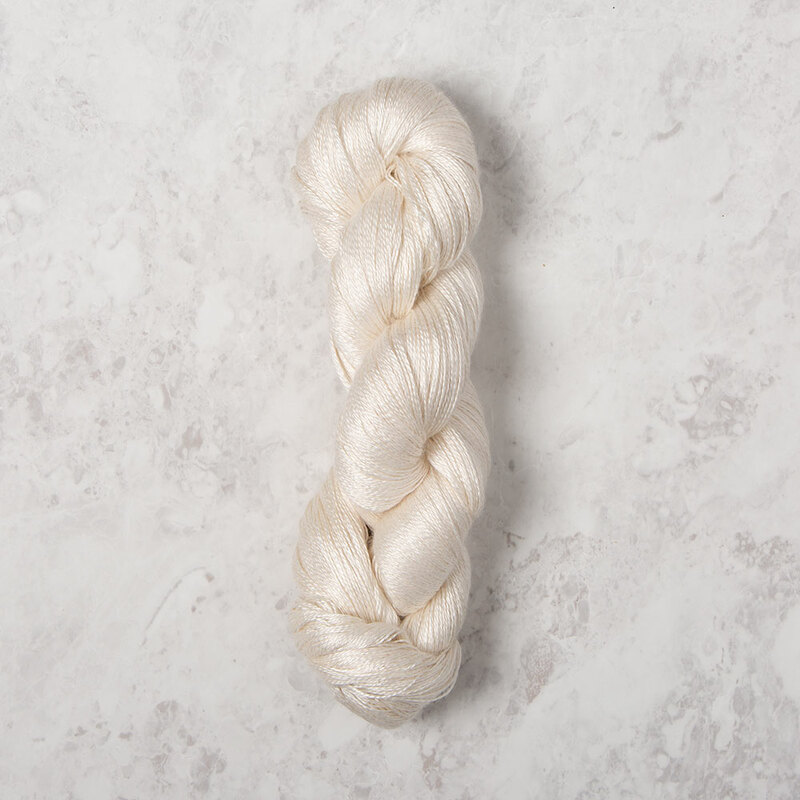 If you want to make something special and you want silk than this is your yarn! The price for 100% silk is great especially the Bare. Knit Picks please get more colors in this yarn. Gradient sets or 4 to 5 shades of each color would be awesome! You will absolutely love this yarn! Despite some of the pictures, this yarn is definitely creamy in color with a yellow undertone. The feel of it is fantastic, so if you're looking for a cream or planning on dying it, you will be very happy. Just be aware that the pictures above show it as white, rather than cream.